I still remember most of the Dr. Seuss books I read when I was little. So whenever I see a new Dr. Seuss book I look forward to the chance to read it to my baby. Ten Apples Up On Top by Dr. Seuss is an obscure title that I had never seen before I read it to Arya. Ten Apples Up On Top is part of the “Bright and Early Board Books” series by Random House which capitalizes on the popularity of Dr. Seuss by extending the line to shorter titles. Ten Apples Up On Top was written by Dr. Seuss under the name Theodor LeSieg which is simply his real name (i.e. Theodor Geisel) with his last name spelled backwards. Originally published in 1961, the board book version was repackage into a small, easy to handle book for little children. Arya loved the small size of the book since she could hold it by herself with one hand and open and close individual pages at will. 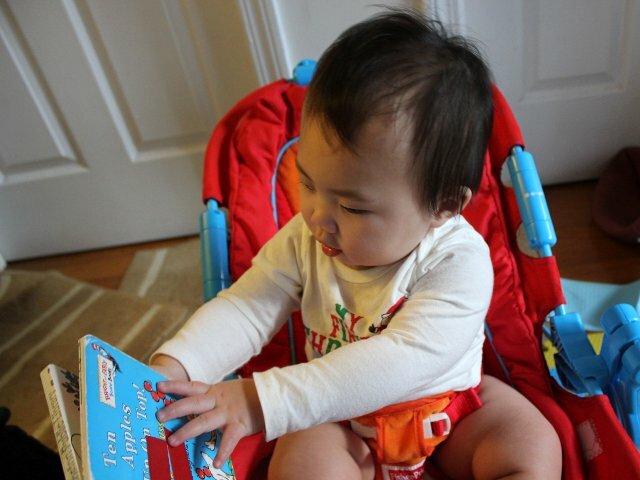 The fun, kid-friendly size alone makes the book a good choice to read to young babies. The nonsensical plot centers around three animals who go through the day competing to see who can balance the most apples up on top of their head. The lion, dog, and tiger go from having a single apple on their heads to keeping ten apples up on top. Amusing pictures accompany the short sentence on each page. The text and pictures combine the counting aspect of the book with a diverse array of backgrounds for the animals and their apples. If Arya was old enough to learn to count we would have been able to spend more time counting the apples on the animals’ head during each page. Ten Apples Up On Top is not a classic like Cat in the Hat and does not convey any larger message like Horton Hears a Who. But it is still a cute book designed to entertain babies and young toddlers. The bright pictures and small size make it a great choice for keeping youngsters busy during car rides or while making dinner. Ten Apples Up On Top costs (including shipping) under $5 new and under $4 used from Amazon.